Centrally located in the Phaya Thai District, Vic3 Bangkok is a convenient 3-minute walk from Sanam Pao Skytrain Station. This stylish non-smoking hotel offers an outdoor lap pool, free Wi-Fi and free parking. 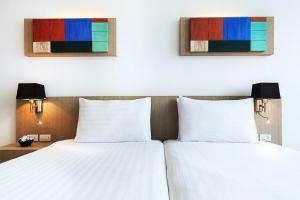 Stylish and modern, air-conditioned rooms are tastefully decorated with wall paintings, and have large windows that offer plenty of natural light. 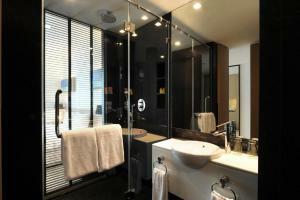 Each room has a flat-screen TV, personal safe and shower facilities. The cosy restaurant serves a variety of local and international dishes. Room service is available upon request. Recreational choices include working out at the fitness centre. Staff at the 24-hour front desk can attend to guests’ requests. Laundry and dry cleaning services are also provided. Bangkok Vic3 is a 5-minute Skytrain ride from Villa Market Ari and a 15-minute Skytrain ride from Siam Paragon Shopping Centre. Studio features a flat-screen cable TV, a work station and an en suite bathroom. 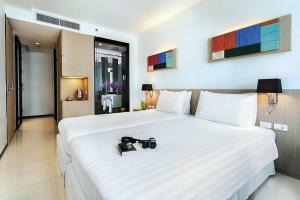 Rate: THB 1952.00 ... THB 3400.00; select dates below to get current rates. 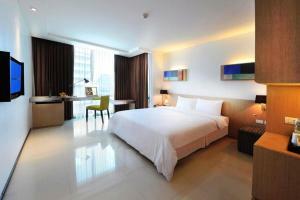 Largest air-conditioned room features a refrigerator, coffee/tea making facilities and a safety deposit box. A hairdryer and free toiletries are included in an en suite bathroom. Rate: THB 2013.00 ... THB 3366.00; select dates below to get current rates.